Your dog is the most loyal companion you have. Your dog can protect you, offer company when you need it, and be otherwise perfectly happy with food, water, and some exercise. However, sometimes there are circumstances where your dog needs a little help because they can’t help themselves. One of these is situations is constipation. Luckily, there are products on the market that can help your pooch become more regular and relieve their uncomfortable symptoms. There are numerous things that can cause dog constipation, and they’re usually the same as the causes in humans: dehydration, foreign objects in the gut, or sometimes there is just too little fiber in their diet. Dog constipation can also be caused by excessive stress from moving or from another aggressive pet in the house (like a mean cat). I’ve included a video below that shows a dog that is constipated, so compare your dog’s behavior to that to determine if your dog might be suffering from the same thing. Dogs usually have a hunched posture when trying to produce a stool and may be vomiting, have a poor appetite, and be lethargic in addition. They may also make frequent trips outside with very little or no stool produced. Your dog may also whine in discomfort, as dog constipation can be very painful. Using Lax-eze to treat dog constipation. It’s always a good idea to verify dog constipation with a vet if the case is severe or lasts for more than a day or two. However, you can also treat dog constipation yourself with Lax-eze constipation formula. It’s offered in both granules and in a homeopathic liquid. Both are also offered together in a full treatment pack which includes a 10oz jar of granules and a 2oz bottle of liquid. If your vet prescribes any traditional drug therapy, you won’t need to worry about using Lax-eze with it. Lax-eze has an all-natural and safe formula that can either be used on its own or in conjunction with other therapies. Lax-eze can help regulate your dog’s digestion and help normalize their stool, which will ease their discomfort and make them much healthier. Help your dog out of their discomfort and give them Lax-eze today! 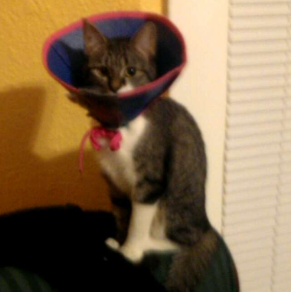 Diarrhea in Cats Can Also Be a Problem for You! Cats are independent pets that don’t require a lot of attention which makes them great for people who work or want a pet that can take care of itself. But sometimes, especially if you have an outdoor cat, your independent pet will get into something they shouldn’t have eaten. Diarrhea in cats can develop even if your pet is indoor only. Sometimes, a dramatic change in diet like a switch from dry to wet food, or emotional stress like a long move or a stay at the vet will wreak havoc on the digestive system of any cat. It’ll be tough on your life, too! It won’t be as uncomfortable as it will be for your beloved pet, but it could ruin clothes, your furniture, and your carpeting too. Well, if your cat develops this problem, we’ve got great news for you and relief for your feline! 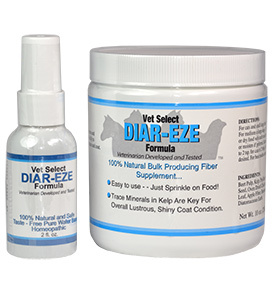 We offer a safe and all-natural product called Diar-eze that will help you treat the most severe cases of diarrhea in cats. To use Diar-eze, simply add a single teaspoon of the granules to your cat’s food. You can also use three pumps of the liquid into your cat’s water bowl or directly into their mouth. Some picky eaters may not like the smell of the granules in their food, so the spray comes in handy. You can normalize your cat to the granules by starting with a small pinch and gradually increasing the dosage to the full teaspoon over the course of two weeks. You’ll receive both the liquid and the granules with the Diar-eze Full Treatment Pack and you can even use Diar-eze in conjunction with traditional drug therapy from your cat’s veterinarian. To normalize your cat’s stools, Diar-eze contains both soluble and insoluble fiber to bind the excess liquid in their colon. With its special formula including trace minerals and natural plant enzymes, Diar-eze also helps to regulate digestion and maximizes the nutrition your pet can absorb from its food. In no time at all, your happy cat will be back to their normal self and without the discomfort of diarrhea. You’ll be happier too without the worry of a messy and smelly problem hurting your pet!